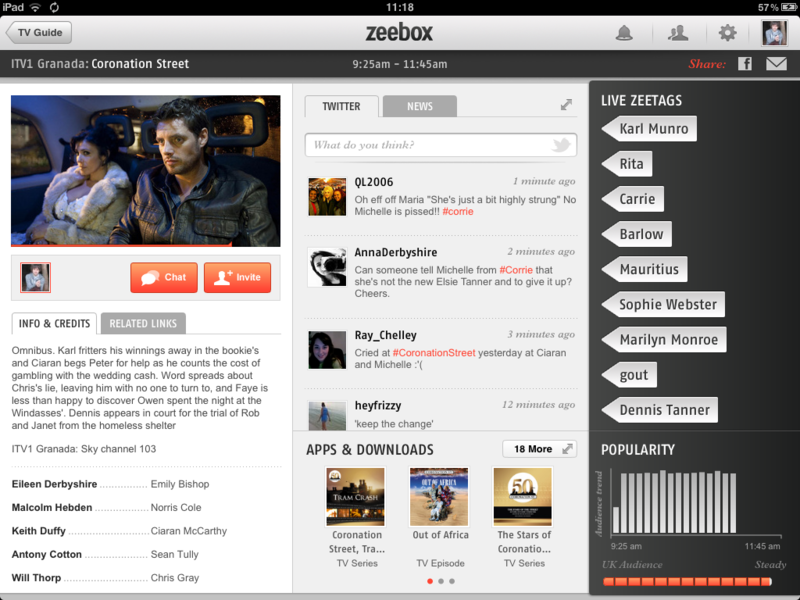 Zeebox: The social TV app that gets it right? While there’s no shortage of apps designed to enhance our TV viewing, be they media check-in apps like GetGlue or more interactive experiences like Miso. An iPad and browser-based app called Zeebox is making its mark in the UK and, whether you can use it where you are or not, it’s worth a look as it just might have the right approach. 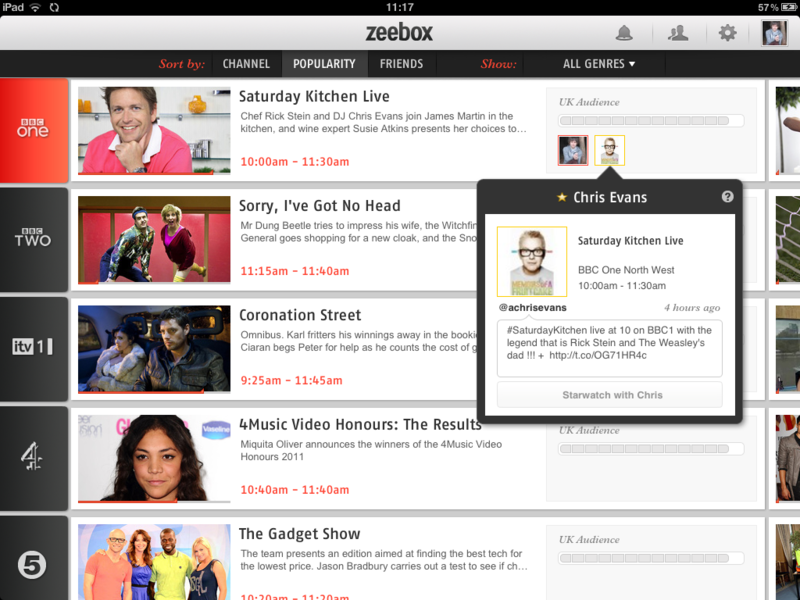 Launched in October this year to a remarkable amount of hype for an app, and updated this week with new features, Zeebox combines a UK TV guide with social features. Tell it your TV service provider and it will display a list of all the current and upcoming shows you can watch – if you have a TV that supports the feature, you can even use the app as a remote control. Log in with Facebook, and it will show which of your friends are watching a particular show. A new feature added this week throws celebrities into the mix, pulling in information from well-known UK personalities’ Twitter accounts to flag up when they’re talking about a show. In the image below, for example, you can see that radio and TV presenter Chris Evans is talking about the show I’m watching (because he’s on it, it turns out). That’s only the start of it though. Tap on the show you’re watching and you reveal its own social dashboard, complete with a description and cast list, the latest tweets and news about it, and a chart tracking the show’s popularity over time. ‘Zeetags’ is an interesting feature, displaying links to background information about the topics being discussed in a show using automatic audio recognition technology running on Zeebox’s servers. It’s not always 100% accurate (I’m sure Top Cat wasn’t mentioned on the news this morning) but generally works well. What was interesting about Zeebox when it launched is that it went straight for the mainstream press – there was no attempt to start out softly by courting just early adopters – this is a high-profile play from a team with pedigree. Anthony Rose, one of the key figures behind the BBC iPlayer and filesharing service Kazaa, is behind Zeebox, so there’s little surprise that it received plenty of attention upon launch. A few weeks after launch though, is it really the future of social TV? Well, it’s certainly the liveliest app designed to complement your viewing that we’ve seen so far. With its live tags, popularity graph and tweets, it feels worth sticking with on your lap as you watch, especially on popular shows, although it can go too far. The X Factor, for example, sees so many tweets that’s it’s impossible to keep up. The user experience is marred slightly by the ‘Apps and Downloads’ section, displaying apps relevant to the show you’re watching. Sometimes these are bang-on (watching Sky News? 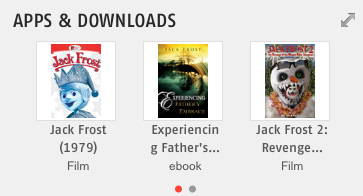 You’ll probably be interested in the Sky News app), but they’re not always quite as relevant (a Christian ebook called Experiencing Father’s Embrace is only loosely related to theme of the Michael Keaton family film Jack Frost and feels a bit spammy). These are all minor criticisms though, and Zeebox is most definitely a work in progress. Showtime is a new feature with potential, debuting in the coming week with the first episode of Channel 4 show Desperate Scousewives, it will allow broadcasters to offer custom, show-specific content accessible through Zeebox. If it takes off, this could, in time, make Zeebox a must-have ‘second screen’ for those wanting more from their television viewing. In an interview with The Guardian this week, Anthony Rose said that iPhone and Android versions are on the way, along with an ability for users to buy merchandise related to what they’re watching. This will use video recognition to spot the ads you’re watching and then offer relevant products to buy.”But this can apply to the songs playing on TV, and links to catch-up content,” Rose said. Zeebox plans to expand to Europe and the US in the future, although Yahoo’s IntoNow and others may steal the march on Zeebox in the American market. Whatever happens in the future though, Zeebox is a very mainstream take on what is rapidly becoming a mainstream problem – how to blur the line between online activity and television broadcasts.